Some bacterial pathogens gain entry and subvert immune detection by surviving intracellularly. Others remain extracellular, but manipulate host pathways from outside. A common strategy employed by both these pathogens is to modulate or subvert the host cellular machinery, by facilitating cytoskeletal rearrangements. This enables internalization, movement, and survival of some intracellular pathogens, while facilitating intimate attachment and anti-phagocytosis of certain extracellular pathogens. Although actin is the major cytoskeletal filament exploited by pathogens, they also manipulate microtubules, microfilaments and septins for survival within the host . Pathogens achieve control over the host cytoskeletal machinery through effector proteins that modulate cellular regulators such as the small Rho-GTPases. A. Zipper Mechanism: Bacterial surface proteins that stimulate cell-cell and cell-matrix adhesion proteins cause membrane to curve up and engulf bacteria and then close in a zipper-like manner to internalize the pathogen. B. Trigger Mechanism: Bacterial effector proteins secreted via the T3SS activate signaling pathways that dynamically modify the cytoskeleton underlying the membrane, creating membrane ruffles that engulf the pathogens. Pathogenic bacteria including Mycobacterium tuberculosis, Legionella pneumophila or Salmonella enterica exploit phagocytosis by professional phagocytes like the macrophages for entry into the host. Following internalization, these bacteria block lysosome fusion to the phagosome, preventing its lysis. The phagosome thus serves as a niche for sustained survival of the pathogen. Apart from entry into the host through phagocytes, bacteria can also enter non-phagocytic cells via zipper and trigger mechanisms (see above Figure). During zipper entry, bacterial surface proteins interact with host membrane proteins involved in cell-cell or cell-matrix adhesions to strengthen these adhesions, causing the membrane to curve up around the bacteria and close in a zipper-like manner, thus engulfing the bacteria. Examples of pathogenic bacteria that enter host cells by the zipper mechanism include Listeria monocytogenes  and Helicobacter pylori . In the case of Listeria internalization, the internalins InlA and InlB are involved and invoke distinct signaling pathways for internalization of the bacterium by interacting with specific host receptors. InlA interacts with E-cadherin whereas InlB targets the hepatocyte growth factor receptor Met . Following the interaction of InlA with E-cadherin, E-Cadherin is phosphorylated by Src kinase and then ubiquitinated by the ubiquitin ligase Hakai. Similarly, InlB interaction with Met leads to Met autophosphorylation and ubiquitination by the ubiquitin ligase Cbl (reviewed in ). Interestingly both InlA and InlB pathways ultimately recruit the clathrin endocytosis machinery (Dab2, clathrin, dynamin, Hip 1 R, Myo VI), which provides an initial platform for actin polymerization through the recruitment of cortactin and activation of Arp2/3 complex. Then a second wave of actin polymerization is triggered during L. monocytogenes invasion that involves a PI 3-kinase, small GTPases of the Rho family and several actin-binding proteins . 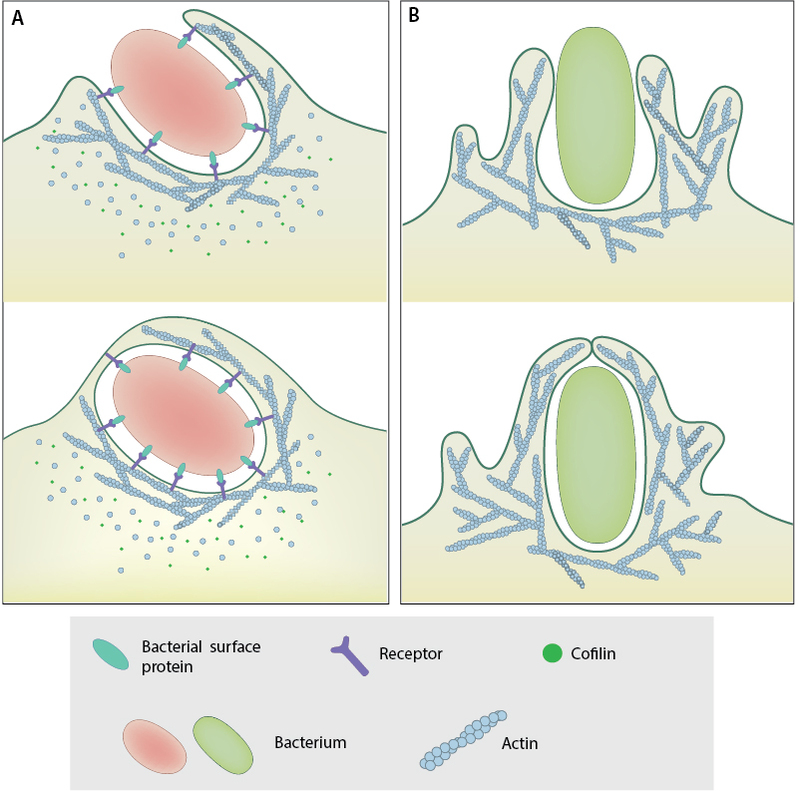 In the trigger pathway, bacterial effector proteins activate signaling pathways leading to large scale cytoskeletal rearrangements characterized by membrane ruffles similar to those observed during macropinocytosis. The membrane ruffles extend around the bacteria and fold over, engulfing the bacteria and then fusing back with the membrane. For instance, Salmonella enterica injects the type III secretion system (T3SS) proteins SopE and SopE2 into the host cell, which activate CDC42 and RAC , causing the generation of actin-rich membrane ruffles  . Viruses exploit different modes of cytoskeletal manipulation for entry into the host cell . For instance, in resting CD4 T cells, the HIV coat protein gp120, viral receptor CD4 and co-receptor CXCR4 activates the Lim kinase signaling pathway, RAC-PAK–LIMK, resulting in actin polymerization, regulated through cofilin polymerization . Viruses are also capable of inducing filopodia in host cells and use them for entry  (Figure). Intracellular pathogens also manipulate host cytoskeleton for movement and sustained survival within the host. Extracellular pathogens can modulate host cytoskeleton for intimate attachment to the host.